The entire planet – including our province – is hurtling towards dangerous thresholds of greenhouse gas concentrations and average temperatures. The planet is already 1 °C hotter than it was in the pre-industrial era, and it is on track to rise above 1.5 °C as early as 2030. That change would bring widespread heat waves, wild fires, droughts, famines and huge losses in ocean food production. This is due to skyrocketing concentrations of greenhouse gases like carbon dioxide. 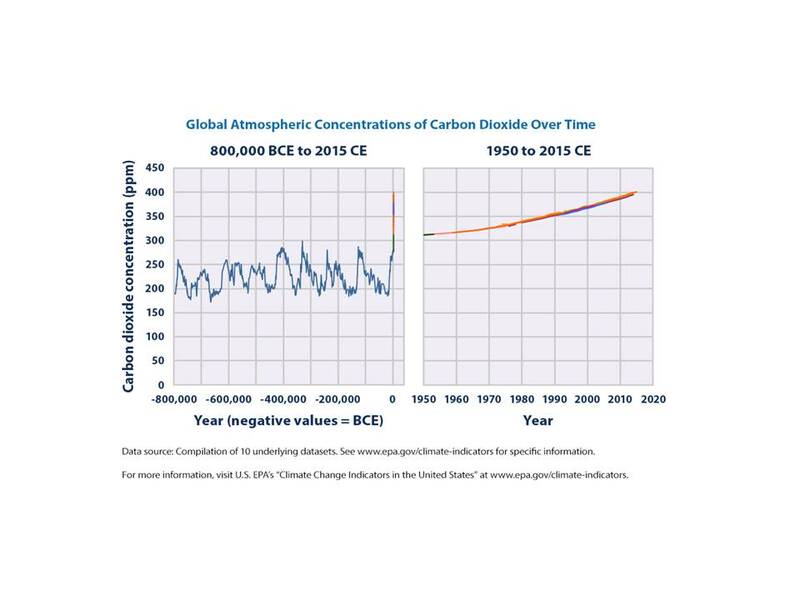 The graphs below show the sharp departure over the past 65 years from the previous 800,000 year trend. RNAO is concerned that Ontario’s existing climate change measures have been scrapped, including carbon pricing, the energy conservation programs funded by that carbon pricing, 758 renewable energy contracts, legislation that supported renewable energy and legislation that committed Ontario to meet its greenhouse gas emission targets. Proposed Bill 34 actually discriminates against green energy. This makes tackling climate change much more difficult. The Ontario government has announced plans to introduce a climate change plan, and is holding an anonymous on-line consultation on climate change. RNs, NPs, and nursing students must let the government know how urgent the situation is. 1. Sign the action alert below and share it with your networks. Urge them to sign and send it to others. You can edit the subject line and email message to add further thoughts. 2. Provide your own comments to the climate change consultation at https://www.ontario.ca/form/tell-us-your-ideas-climate-change. This consultation is open until November 16, 2018. Ontario is facing a climate change crisis, and must do its part to avoid disaster and to prepare for major climate challenges. That means sharply reducing greenhouse gas emissions. I join the Registered Nurses’ Association of Ontario to call on the province to come out with a climate change plan that comprehensively addresses all sources of greenhouse gases, including transportation, industry, buildings, electricity, agriculture and waste. The plan must also, at a minimum, meet Ontario's existing targets of 15 per cent below 1990 levels by 2020, 37 per cent by 2030 and 80 per cent by 2050. The plan must support renewable energy projects and not disadvantage them against dirty energy, as current policy and legislation do.